(left) Huang Xiaoming, and (right) Zhang Ziyi in John Woo's The Crossing I. The Skinny: The first of John Woo’s two-part war drama entertains while also underwhelming with its simple characters, unexplored themes and sometimes giggle-worthy John Woo-isms. As a whole, The Crossing I doesn’t impress but its size, scale and romanticism make it a fine throwback to old-fashioned, less cynical moviemaking days. Featuring doves and not much of the sinking ship you might be expecting. Hey, John Woo made a movie again! The heroic bloodshed auteur turned Hollywood hired man turned Chinese filmmaking god finally returns to the big screen with the romantic war drama The Crossing I, the title of which naturally tells you there’s going to be a Crossing II. This is the first of two films set during the Chinese Civil War that culminate in the sinking of the Taiping, a steam-powered boat that ferried passengers across the Taiwan Strait from Shanghai to Keelung. The 1949 Taiping sinking resulted in over 1500 deaths – so basically, John Woo is making the Chinese Titanic, except with older stars and a whole lot more of them. At its core, The Crossing 1 is an old-fashioned Hollywood film about beautiful people passionately longing for other beautiful people, and producing a duology on this subject seems a bit extreme. Then again, John Woo makes so few films that a little more from him is good. At this point in Hong Kong Cinema history, we should count our blessings. Despite being in the film’s Chinese title, the Taiping gets only cursory focus in the first Crossing – hell, the characters aren’t even on the boat yet when the film ends! Just guesstimating here, but maybe 1-1.5 hours of the full 4-plus hour Crossing experience will portray the ship’s unfortunate fate, so if you’re in this movie for sinking action prepare to be underwhelmed. Everyone else can thrill to the romantic exploits of six very pretty people, starting with General Lei Yifang (Huang Xiaoming), a fictionalized hero of the Sino-Japanese War who’s assigned to lead a key division in the Nationalist Army during the Huaihai Campaign, the decisive battle of the Chinese Civil War and a very bad time for the Nationalist forces. Before heading off to Huaihai duty, Yifang marries Zhou Yunfen (Song Hye-Kyo), a spirited music teacher whose main traits are dancing barefoot and being from a rich family. Yifang leaves Yunfen when he heads to the warfront for an extended siege, which results in longing gazes into the distance and lots of voiceover via letter narration. While Yifang is at war, Yunfen travels to Taiwan to safely await his return, and meets Yan Zekun (Takeshi Kaneshiro), a Taiwanese doctor who was conscripted to serve in the Sino-Japanese War on the Japanese side. After doing time in Fengtian Japanese POW camp, Zekun returns to Taiwan where he grouses about having some form of PTSD. Not that one could tell, what with Takeshi Kaneshiro’s laconic demeanor, but Zekun suffers from stress that inhibits his happier memories. Related: Zekun longs for Masako (Masami Nagasawa), his Japanese girlfriend from his school days but she’s no longer in Taiwan. However, Yunfen may be able to help Zekun reconnect with Masako. Audiences get all this plus Nationalist Army communications officer Tong Daqing (Tong Dawei), who serves beneath Yifang on the warfront while pining for nurse Yu Zhen (Zhang Ziyi), who he met in Shanghai for a fake marriage photo. Yu Zhen regards Daqing well, but she’s stuck on a soldier who likely perished in battle. Down on her luck, Yu Zhen ends up turning to prostitution for survival. Sans a sinking ship, Crossing I is a romantic war movie – basically a Gone with the Wind with questionable historical commentary and unremarkable love stories. History first: The script drops in a few glaring pro-Communist references. Early on, a businessman incredulously says something like, “Maybe changing to Communist rule would be better.” The movie also panders during the Huaihai Campaign, which depicts the besieged Nationalist Army suffering while their Communist opponents happily receive supplies from adoring, rosy-cheeked civilian supporters. This is propaganda, and the moments are dropped in so awkwardly that it becomes obnoxious. Also raising eyebrows are numerous crowd scenes where the Nationalist Army and police suddenly show up to beat up the Shanghai citizenry. Those darn Nationalists! Granted, this stuff actually happened during the period but the script doesn’t develop an atmosphere of fear or tension. We’re given lots of interesting thematic content – politics, racism, classism – but little is overtly explored. It’s just serious stuff that intrudes on the pretty romances, and slows the film down. Also, like too many recent historical dramas, context is assumed to be understood – a fair practice for Chinese audiences, but tougher going for international viewers showing up on the strength of John Woo’s name. Then again, knowing the particulars of the Nationalist-Communist conflict doesn’t make the characters more complex or interesting. The only thing really going on here is the love stories, which are astoundingly simple. Relationships are drawn with the most familiar romantic strokes, and all the principals are super-nice character types, e.g., the dopey soldier, the shell-shocked doctor, the whore/nurse, the pure schoolgirl, the free-spirited rich girl and the greatest general ever. Seriously, Lei Yifang is super-righteous, never punishes his men for treason and consistently acts like the prototypical John Woo hero – which is great because this is a John Woo film but ridiculous because this sort of leadership gets you nowhere in a war. The film also lacks a proper foil who would give Woo’s heroic archetypes some shading or depth. Mostly the characters appear to be unrealistic paragons of virtue. Where Crossing I succeeds is in its old-time Hollywood film grandeur. This is a big, big movie with grand sets and large crowds, and the top stars do their part. 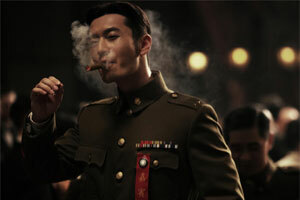 Huang Xiaoming cribs from Chow Yun-Fat’s playbook, overacting as Lei Yifang with suave gestures and tortured gazes. He also chews cigars like a boss and seems generally awesome in an over-the-top romantic way. In contrast, Takeshi Kaneshiro is sensitive and reserved, though he gets comparatively less screentime. The unintentional high point for Kaneshiro may be the flashbacks where the 40 year-old actor dons a school uniform and plays the most haggard-looking high school student ever. Of the actresses, Zhang Ziyi makes the strongest impression in the most put-upon role, while Song Hye-Kyo is engaging and Masami Nagasawa is basically one-note sweet. The best of the bunch is Tong Dawei as a super-swell regular Joe who possesses warmth and humanity in spades. If Huang Xiaoming is this movie’s Chow Yun-Fat then Tong Dawei is its doughy, less intense version of Tony Leung Chiu-Wai. Comparing Huang and Tong to the Hard Boiled pair is appropriate given the film’s battlefield climax, where the two do the John Woo bromance thing while shooting Communists and watching machinery explode in slow motion. The action isn’t exhilarating or intricately choreographed but it’s appropriately big and bombastic, and when a truck flies about twenty feet in the air in slow motion, well, that’s pretty cool. This first film does hint at lesser roles (or none at all) for certain actors in the sequel, which creates emotional stakes that should carry forward to The Crossing II. Sadly, the pathos also means that some actors will not have a chance to interact. Huang Xiaoming and Tong Dawei get buddy-buddy moments in Crossing I but Takeshi Kaneshiro barely shares a scene with either, and the women don’t interact with each another at all. This is an all-star film but perhaps not the type that audiences want (you’d understandably expect everyone to meet at some point) so that’s another debit on Crossing I as a full-fledged audience picture.